Hydration and proper nutrition is vital to helping athletes perform to the best of their ability. School Health has the products you need to stock athlete fueling stations WITHOUT fighting the big box stores. Each day our athletes are called on to complete feats of strength, stamina, and endurance. Through training, athletes become stronger and more physically tuned. But for peak performance, it is important to include nutrition and hydration as part of our basic training regimen. In 2014 the NCAA Division I deregulated restrictions on sports nutrition, allowing student athletes unlimited access to meals and snacks related to sports participation. With the sudden unfettered ability to fuel athletes, many athletic departments have been scrambling to create nutrition programs for the athletes they serve. As they try to keep supplement supplies stocked, many athletic trainers have resorted to big-box store shopping, which means last minute trips and costly purchasing. School Health has worked to gather the best supplements to fuel athletic teams. And, with a School Health Supply List, keeping nutrition items stocked is easier than ever. With supply lists, athletes and athletic trainers can build customized lists of their favorite products, and even select automatic delivery! Here is a quick reference to help athletes and athletic trainers know which products to use and when. Before and during a workout an athlete’s body requires high amounts of carbohydrates to saturate muscles with glycogen that fuel performance and provide endurance. Supplements like the Clif Shot Bloks Electrolyte Chews are a great way to get these carbohydrates in to your system. After a workout, protein helps facilitate repair and recovery of fatigued tissues. It’s easy to get this protein on-the-go with the LUNA Protein Bars. And at all times athletes must maintain proper hydration to ensure that they stay strong and safe. Athletes can carry The Right Stuff concentrated drink additive – an easy way to add electrolyte rich hydration to your favorite water bottle! Proper nutrition is also an integral part of building muscle mass, losing weight, and maintaining energy levels throughout the year, even when athletes are not training. Try CLIF Bar nutrition bars for a delicious and convenient way to maintain nutrition. Pre-event meals should take place 2-4 hours before an event, and then “topped off” with a high carbohydrate product like the Gatorade Prime sports drink 30-60 minutes before the event. During exercise, athletes should consume 16-24 oz of water or sports drink per hour. To stay hydrated, a good rule of thumb is for athletes to consume at least half of their body weight in fluid ounces (preferably water) per day. The School Health Horizontal Power System is an ideal solution to provide side-by-side water and sports drink hydration. During high performance or in warmer temperatures when sweat rates are heavy, athletes can consume a high sodium snack or sports drink to stay hydrated. Research has shown that recovery shakes and snacks are most effective within 30-60 minutes of a workout. We recommend products like the Gatorade Protein Recovery Shakes. Recovery products should have a 2:1 ratio of carbohydrates and protein. We recommend the First String Blast Protein Powder as a great way to gain this ratio. Athletes who have long training sessions and burn extreme amounts of energy can see increased performance by using these recommended supplements. 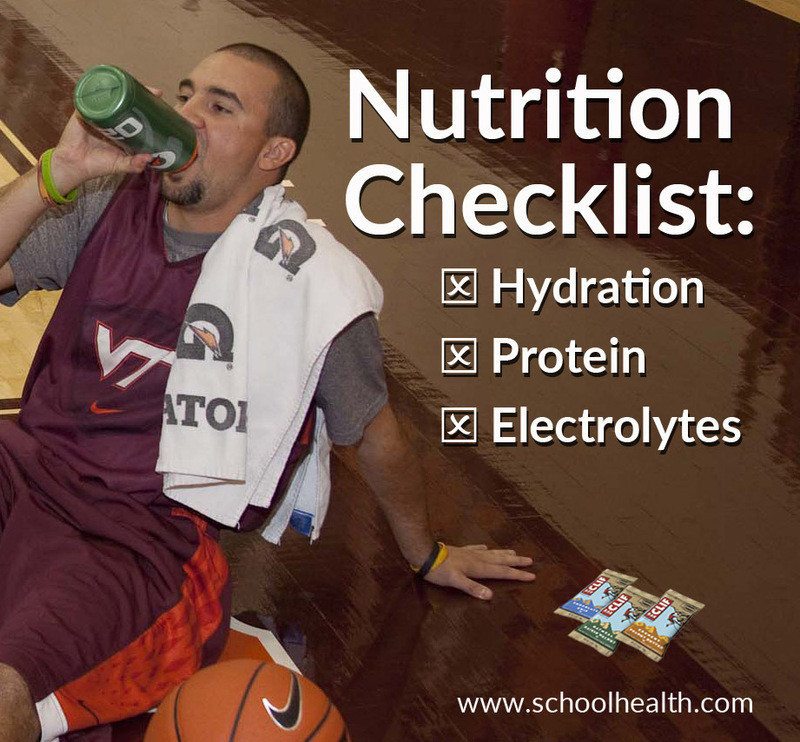 School Health – Sports Medicine offers many other options to stock your nutrition and hydration station. Contact us today to tailor a delivery that fuels your team.